Another Boston, another year of crushing weather. We invest months of training and plenty of money, then get a crummy day. This year, instead of running Boston, I ran Houston, in January. Flat, fast, well organized, and (this year) cold, clear, and still. Last year, when my little brother turned 60, we agreed to run Houston again. We grew up there and still had lots of friends in the area, plus a sentimental attachment to the race. Bob’s always been a lot faster than me, so we didn’t plan to run together; instead, we just corresponded, cheering each other’s training remotely (he lives in DC and I’m in Seattle). We started badly, each with tender hamstrings, but eventually managed to string together about 3 months of good running apiece. Not as much as we would have liked, but that’s life. In the meantime, Harvey beat up Houston pretty well. Nevertheless! We met up a few days in advance, leaving time to tourist, see friends, and jog a bit. The hurricane made a terrible mess, especially in Dickinson, where we grew up. Seemed like every house in the area had a trailer and a dumpster out front – the trailer for living in and the dumpster for holding old sheetrock, carpet, and general debris. Pretty sobering. Jogging was similarly sobering. When we lived down there, lots of the weekend running centered around Memorial Park, with a 3-mile dirt loop and access to useful trails up and down Buffalo Bayou. But a couple of years ago, a drought killed off the bulk of the trees in the park, leaving it looking like a clear cut. But the weather was cold and clear, and we were well tapered, so we had hope. After a sleepless night, I got up absurdly early, did my morning stretches, and tried to go to the bathroom. Finally stumbled downstairs and found the starting corral. (You’ll notice I’m not mentioning Bob; we managed to miss each other in crush and so started separately, avoiding the temptation to run together.) As it happened, he started with the gun, while I was in a porta potty. Chip timed though, so no problem. I went out too damned fast, well under 7-minute pace (I was unclear about my goal, but 7-minute seemed plausible). But I certainly felt good, and was passing people left and right, which is always fun. At about 6 miles, I caught Bob, standing on the side of the road. He’d started well, but his hamstring cramped, leaving him pretty hobbled. He started up again, limping mightily, and we ran the rest of the race together. At first, I pulled him along. Then, as his leg loosened up, we were a good team. And finally, near the end, as I fell apart, he jollied me along and we finished together. But (! ), since he’d started before me, the chip timing put me about 30 seconds ahead. First time I’ve beaten him since junior high, when he ran track and I played trombone. I ran 3:14:41 and finished 2nd in the age group while Bob was 4th. In fact, the first 5 in our age group (60-64) finished within a couple of minutes. We saw the winner go by near the end, but I was done and he looked like a locomotive. Maybe next time. Perfect weather (this year, anyway). 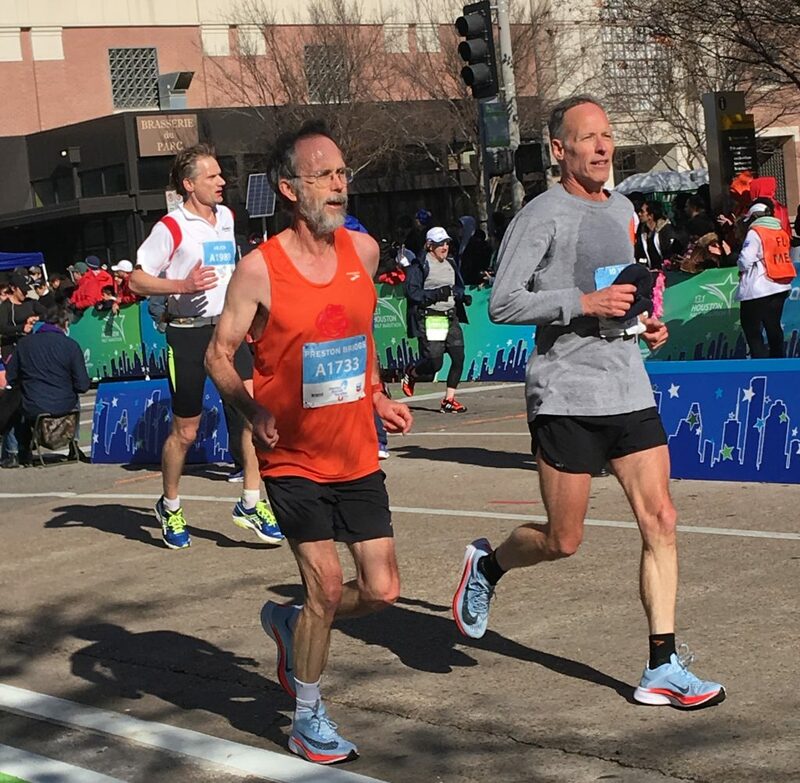 And while it’s not so big as Boston, it’s well organized with plenty of competition (13+ thousand in the marathon) and lots of cheering spectators.